I am sharing some images from around our yard. I love watching and feeding my yard birds. I think in the winter months the birds appreciate the extra food. 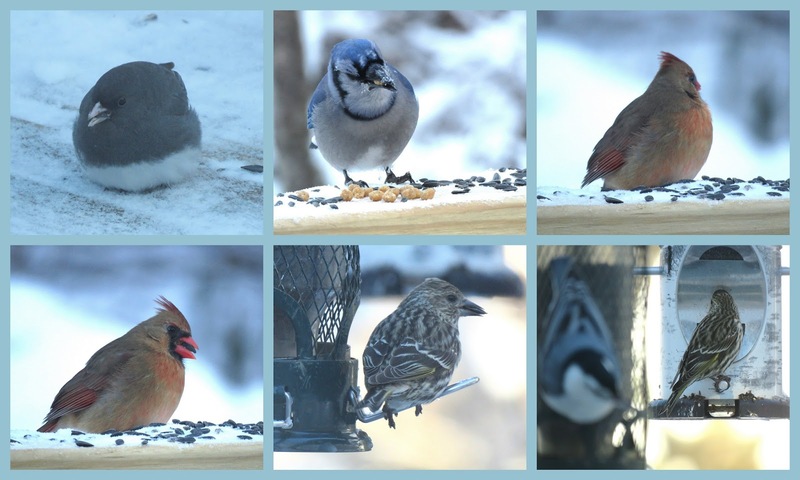 I have various offerings of suet, sunflowers seeds, peanut nuggets and the heated bird bath on our deck. 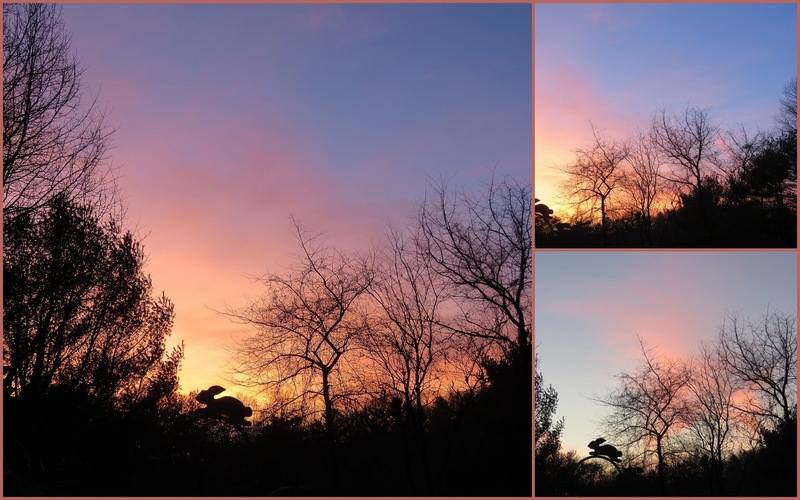 On Feb 2 and on the 3rd we saw a pretty sunset from our yard, the colors were beautiful. These are images from Jan 28 through Feb 3rd. BTW, the Great Backyard Bird Count starts on Feb 15th through Feb 18th, will you be counting your yard birds? 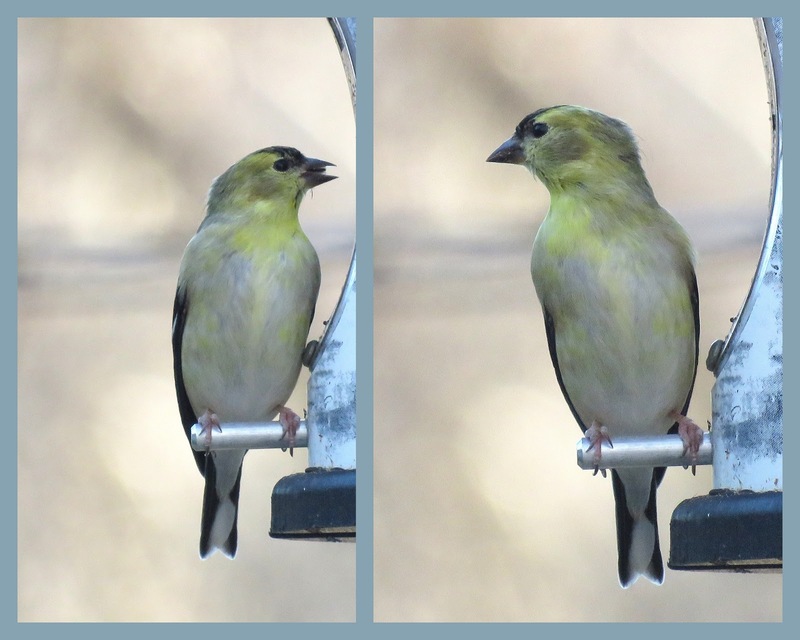 Jan 28th, this pretty male Goldfinch was on the thistle feeder. Jan 28th, a cold snowy day. 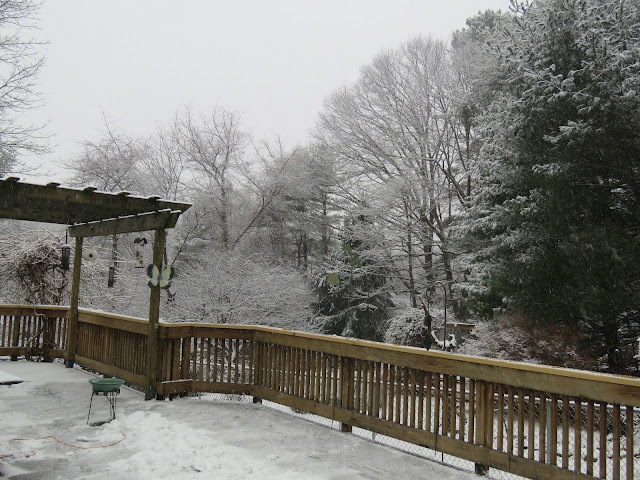 I cleaned the snow off the deck and feeders a few times. Jan 30th, more snow and the birds were all over the deck and feeders. Below are the Dark-eyed Junco, Blue Jay, Female Cardinal, Pine Siskin and White-breasted Nuthatch. 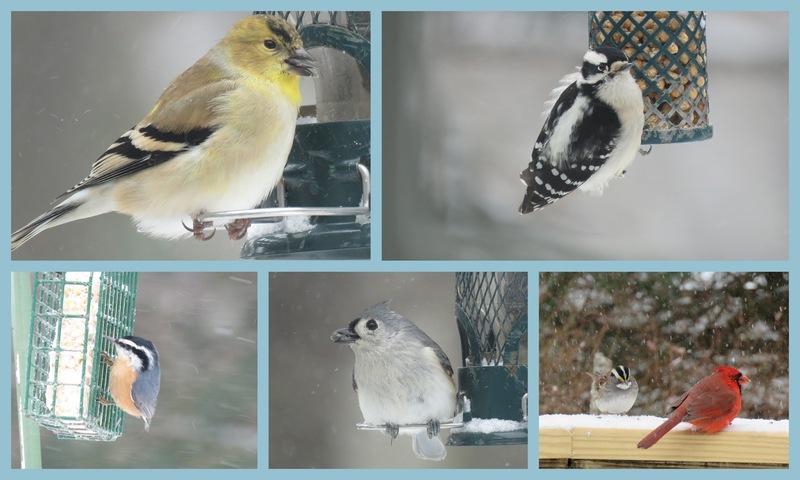 Below: the American Goldfinch, Downy woodpecker, Red-breasted Nuthatch, Tufted Titmouse, White-throated Sparrow and a Cardinal. Jan 30th, within a couple of hours we saw first a pretty blue sky and then a snow squall passed through hours later. 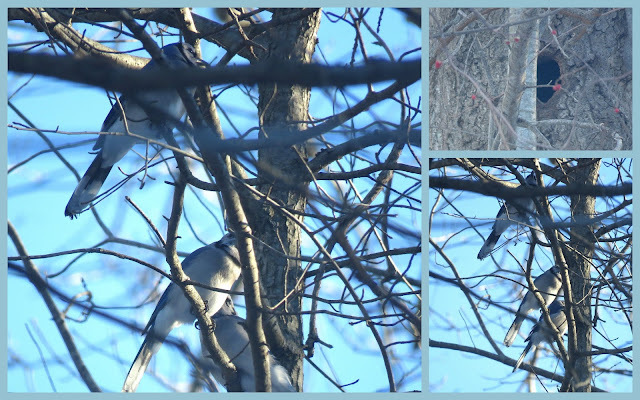 I watched these 3-4 Blue Jays hanging around a hole in the tree across from our driveway, they were fussing and landing in front of the hole. I have been watching this hole in the tree from my kitchen window, hoping to see a owl head popping out one day. Not sure what was inside, maybe the Screech Owl? Cute squirrel with snowflakes on his face. Feb 2nd below are the male Cardinal, Downy Woodpecker, Red-breasted Nuthatch, Red-bellied Woodpecker, White-throated Sparrow, female Cardinal and a Dark-eyed Junco. Pretty male Cardinal in our pine tree. Feb 2nd and the 3rd, we saw two beautiful sunsets. The bunny is on a hook that hold my bird feeder. Lindas e belas fotografias, aproveito para desejar uma boa semana. Great set of photos. I was trying to put out extra bird seed during the polar vortex. I haven't gotten any photos of the birds at my bird feeder though, to be able to share. Your photos are fantastic. The birds would most certainly welcome the feed you leave out Eileen. 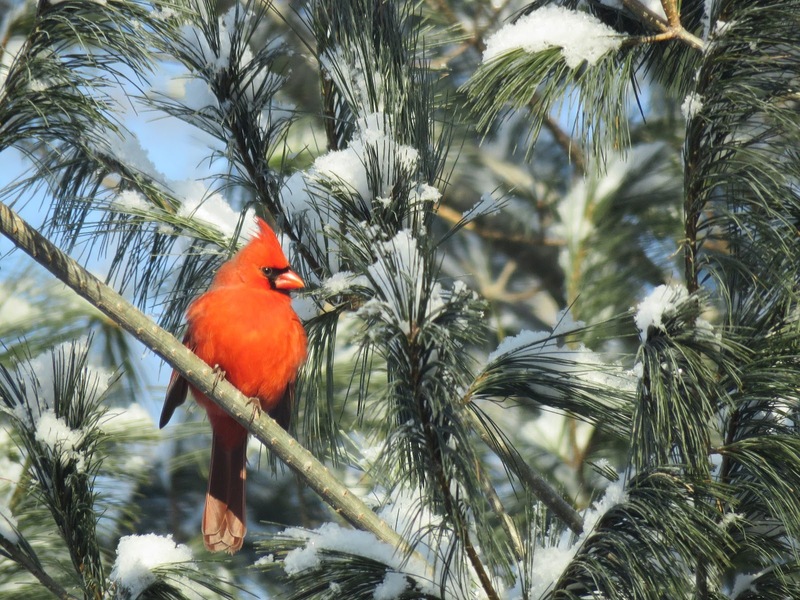 That photo of the Male Cardinal in the pine tree is stunning! There are some happy looking birds there Eileen! That squirrel is adorable! Looks like you have had a lot of snow, Eileen, and I am sure the birds know where there is a ready source of food. The other day someone asked me how much I spend each year on bird seed, and you know I have no idea. Probably less than many spend on movie tickets, or eating out, but what I do know is that it gives me a lot of pleasure. What a lovely series of feathered friends...and warm-coloured sunset. The birds are all so cute...I am hardly able to say my favourites. Have a nice continuation of winter! I always loved watching the nuthatches! And we have not seen a Goldfinch here yet but they will come to our feeders when they arrive! Enjoy your week! Beautiful photos from your yard. The birds are very hungry here too when it's cold and snowy outside. Happy Monday, and have a nice new week! Beautiful group of photos! The blizzard looked SO COLD. We had no snow yet, I say yet because it could still happen. I hope your owl is in that tree cavity and thinking of nesting there!! First of all, you have VERY clean windows! Splendid photos and lucky you are to have so many varieties of birds come along. That cardinal shot is breathtaking. 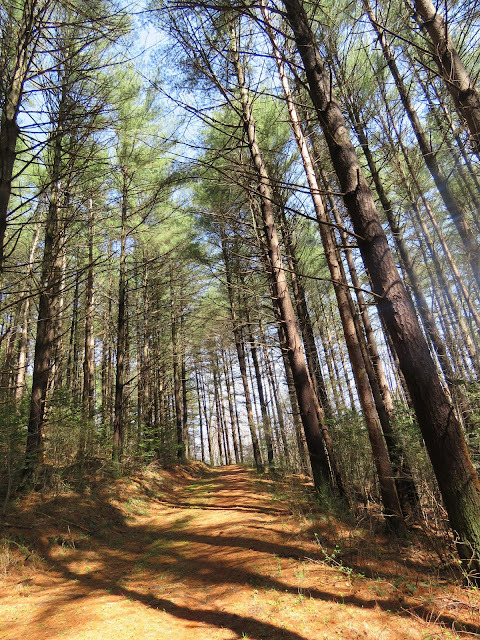 You have a beautiful backyard, Eileen and so many trees nearby! It is easy to see why so many birds love stopping at your feeders. I love all your photos! that hole cold be a cache of food from a squirrel. you have nice diversity, I putout whole shell peanuts just to watch the jays open them. The cardinal in the pine tree would make a beautiful Christmas card. Wow! You have had a great bunch of birds visiting your backyard! No Pine Siskins here... I am jealous! Finally saw some Dark-eyed Juncos today... it's rainy, and they were foraging under the feeder pole. And you get visited by a Red-breasted Nuthatch... so very Cool!! Thanks for sharing! Hugs! Eileen - I am amazed at the variety of birds you get at your feeders. I guess it's because we are so far north that we only get siskins, chickadees, nuthatches, juncos, and downy woodpeckers. So I have to live through you to see others!!! Love the squirrel with the snow on his nose! Thanks for linking these delightful mosaics to Mosaic Monday. Have a great week! Your Winter is really beautiful. And your feeders paybyou back with wonderful birds and photo ops! Everything looks so pretty in the snow! I have had some goldfinches at my feeders and in my backyard for the last few weeks. My feeder visits sparrows and titmouse, and you have so many different things that I could not get a good look. I think I would sit in the window all day and admire. Greetings. Y alimentarlos habla de la gran conciencia de vida con los seres de este Planeta. Hermosas fotos...todos precioso y ese rojito es un bello pajarito. How beautiful are these creatures. I wonder if the squirrels are not cold at all. Your Goldfinches look so much more spring-like that ours. Ours are still quite dark olive green/brown. The cardinals are sure red though! 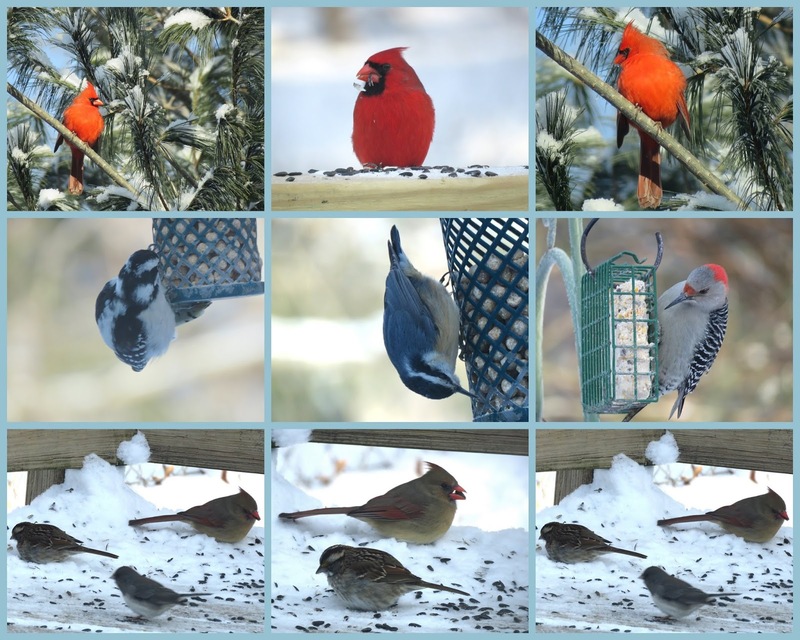 How special it is to see such a variety of birds visit your feeder and you have a front row seat. That is priceless, Eileen. Thanks for sharing your beautiful photos and have a lovely day and new week. I love your birds, so pretty. My favourite is the Northern Cardinal, it's beautiful. Your shot of the squirrel is my favourite. Looks very much like my yard except I haven't seen the Blue Jays lately..I'm glad..nasty birds..I once saw them clean out a nest of babies..I hope whatever is in that hole is safe from them..Good pics, Eileen.. The sunset & cardinal in the pine tree are my two favorites. I bet the birds keep you busy feeding them. You have such a lovely variety of birds who come to your yard, Eileen. Love the shots you got of them and the mosaics you created. Looks like you are experiencing a little snow, too. You have many very attractive visitors. You have such an interesting variety of birds in your backyard. Not so much here. Thanks for reminding us about the bird count. You always have the nicest posts Eileen. Love all the birds you see and photograph. The sunsets are spectacular too. You have a lovely group of birds at your feeders. What a grand bunch of photos...sure love seeing all your birds...that last cardinal shot is a stunner...such a sharp dressed man! Are you sure you don't live in Indiana;-)(Just teasing...about the quick weather change) One time when I had only been here less than a year, I worked the evening shift...about 12-14 miles from where I lived. I went through absolute downpour of rain, to bright sunshine, back to downpour, back to sunshine, then back to a literal downpour...in the 20-25 minutes it took to get to work! I could not believe it. I always enjoy seeing your birds, Eileen. Our activity around the feeders is slow right now. Perhaps our little visitors have gone to visit the neighbors. I bet they get a good variety of treats going house to house. Hmmm, sounds like trick or treating for the birds. Enjoy your day! Very nice pictures of birds! 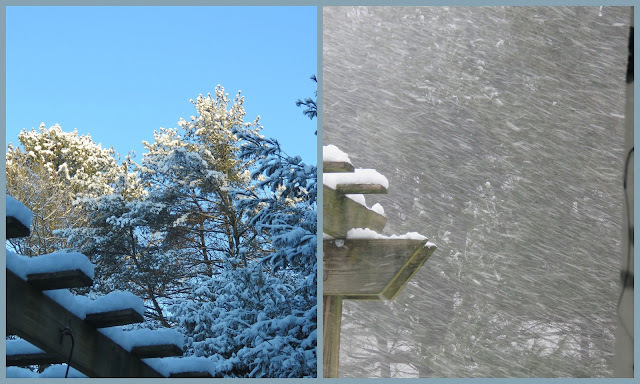 Beautiful shots of your sky, snow and critters! Wow! Great photos again from you! It’s always a great pleasure to read your Post... lovely captures of the birds! You have a great range of birds to watch and admire. Thanks for sharing. Beautiful photos and collages in your blog. The sunset is also great to see. The cardinals sure pop out in the white snow. The squirrel is so cute with the snow flakes on him. Have missed looking at your photos, your Yard birds are stunning such a great verity, beautiful photos too. We have not had as much snow this year or to cold. Still plenty of food out if the birds need it though. wow eileen, you are seeing all the birds i usually see and have been missing for what seems to be forever. i am seeing a few birds here and there but nothing like i usually see!! your male cardinal captures are stunning, the one in the pine tree is one of the best i have ever seen. i'm glad you did not crop it, i love seeing the pine tree and the snow in the background. the sunsets have been pretty here too, your pictures are gorgeous. it looks like a silhouette of a bunny in the center!! Super shots of the yard birds. There used to be a lumber company out here called Yardbirds. That's a lovely long view of your deck eileen. Wow, your birds even have a heated bird bath! I am so impressed and it obviously helps in getting such a wide variety of visitors. What a fabulous series (and mosaic) of photographs you've shared here Eileen, they are all so lovely. I am sure that during the cooler winter months the birds appreciate any extra food put out for them … so do squirrels, that is a super photograph of the squirrel. Beautiful and exhilarating sights. You must have the best deck in town. All of that color and life and I'm still drawn to the downy woodpecker. Gorgeous photos, as always, Eileen. We are seeing a lot of little flocks around here lately, they must appreciate our sunny weather when everywhere else is so cold. Very nice pictures. So great to see sll these special kind of birds. Nice with the snowy area. Shot 9 is so well done. Amazing!! The cardinals are so beautiful, especially against a background of snow. And I love the nuthatches and chickadees and flickers. So many beautiful birds! Beautiful winter pictures. So nice to see the birds visiting your yard. Great capture of the bunny in your lovely sunset pictures. Your photos of the birds are so clear and colorful. That's not easy to do. I love the red of the birds against the muted winter landscape. Love that little red bird!